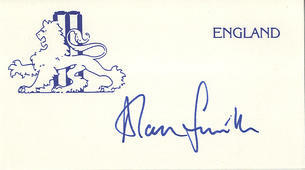 This is a Hand Signed White Card 3.5" x 2" by the former Warwicks and England Cricketer who played in 6 Test Matches for his Country. Alan Christopher Smith, known as A. C. Smith (born 25 October 1936, Hall Green, Birmingham, Warwickshire) is an English former Test cricketer, who appeared in six Tests for England. Primarily a wicket-keeper, Smith was also a capable right-handed middle-order batsman and right-arm seam bowler. Most unusually for a regular wicket-keeper, he was sometimes selected by Warwickshire as a frontline bowler.